Hope you’re having a wonderful new-moon week. Now that we’re in the final days of January, do you feel like you’ve had a chance to settle in to your 2014 routine? Maybe you’ve started to get an idea of what’s working and not working with your resolutions, be they health-related or something else entirely. Those of you who’ve been reading this blog a while will not be surprised when I tell you that one of my pet peeves is when someone tells me, “I decided I need to lose weight, so I bought this book…” Basically, I just want to hit that person over the head with said book because nine times out of ten, said book is written by someone without any actual health credentials. Once in a while, though, an exception graces the shelves. 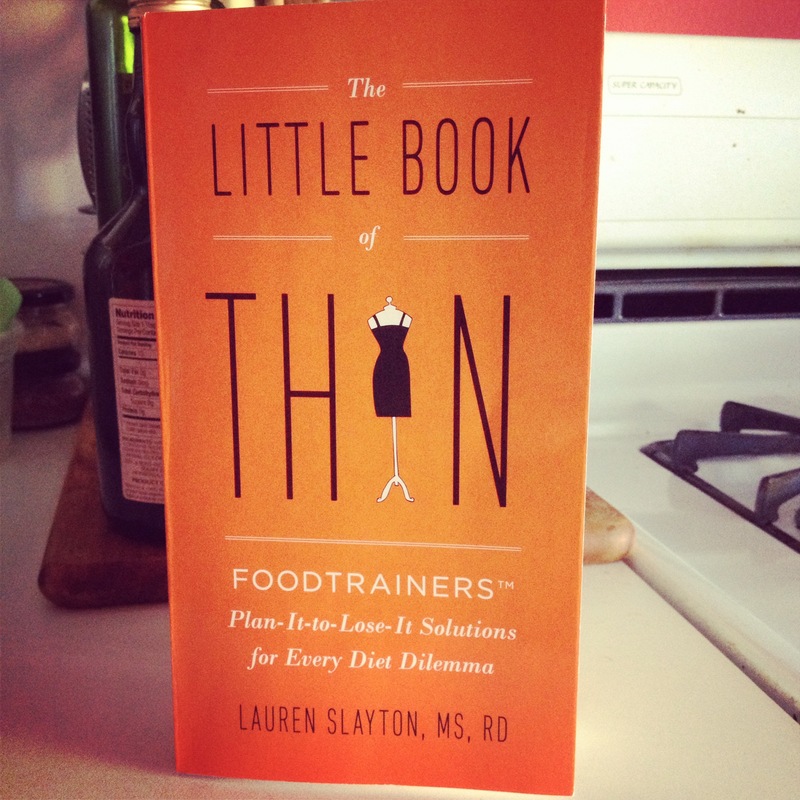 Enter the Little Book of Thin (aka LBT) by Lauren Slayton, MS, RD, founder of the NYC nutrition practice, Foodtrainers. Not only is this slim volume packed with practical advice on how to “plan it to lose it,” it’s a fun read, showcasing the sharp wit and no-drama approach to healthful eating that’s made me a longtime fan of the Foodtrainers blog. You’ll also love the LBT cheat sheets and No-Roll-Odex of healthy products! Lauren was kind enough to engage in a little Q&A about the book and share some of her favorite NYC restaurant eats. Jess: Thanks for being game to do a little Q/A, Lauren. Can you tell us a little about the inspiration behind LBT? Lauren Slayton: I opened my practice Foodtrainers in 2001. While my sessions are 1 on 1, there is so much when it comes to situations (socializing, traveling, work life, family life) that’s universal. I wanted to distill what I’ve learned into one little book. It was very important to me that I wrote the book myself and that it was a good read. J: I love your section on being “choosy” with your foods when it comes to dating—what are some of the most common mistakes you see your single clients making? LS: Whether it’s dating or simply socializing there’s a lot of posing when it comes to our food (an Elle magazine article where even women who diet are embarrassed to admit it comes to mind). Either women or men eat in the way they feel they are expected to eat OR they come on too strongly as the “diet chick.” Healthy isn’t shameful, right? J: You talk a lot about planning ahead in LBT—your Food First Aid Kit for travel is brilliant. For a slightly shorter trip (say, a marathon day of jetting about town between appointments), what are a few of your favorite purse-friendly foods? LS: I am a bit of a tea freak- currently toting pukka tea bags everywhere (cleanse is a favorite). I fill my Foodtrainers Nutcase daily with a different nut or seed. Hail Merry rosemary pecans, KOPALI superfood mix with cacao and mulberries are great. Bars work well too. J: Which weight-loss myths annoy you the most? LS: Either “everything in moderation” which often leaves us feeling only moderately well OR calories in versus calories out which ignores the quality of the calories and the timing of our food both subtleties that can affect our health and size. J: You talk a bit about healthy restaurant options in LBT—what’s one of your favorite restaurant meals lately? LS: Ooh if I’m being honest I’ve been on planet book and haven’t been out a ton but I adore Green Square Tavern—chef John Marsh made chia shrimp for my book signing, and I am hounding him for that recipe. The scallop crudo at ABC kitchen and the warm Brussels sprout salad (and polenta fries, yes) at Candle 79 make me happy. How great is it that restaurant eating is no longer synonymous with unhealthy? J:What surprised you most about the process of writing/publishing a book? Any advice for aspiring writers out there? LS: Yes, talk to anyone you know who has written a book because there’s so much that’s untold. Mark Ellwood (Bargain Fever) Rachel Hofstetter (Cooking up a Business) and Aidan Donnelley Rowley (Life After Yes) each pulled me aside and said “make sure you do this”. In turn, I’d be happy to do the same for anyone in the writing process. You can get your copy of LBT here. What are some of your pet peeves when it comes to weight loss and diet myths? What are your favorite busy-day snacks? Do you eat differently on dates? What are some of your favorite restaurant meals of late? This entry was posted in Uncategorized and tagged books, dating, dieting, January, Lauren Slayton, LBT, Little Book of Thin, nutrition, NYC, resolutions, weight loss.